The Internet version of BBC News just released notice that the island nation of Mauritius is suing UK for legislating a Marine Protected Area around British islands close to Mauritius (1000 km). 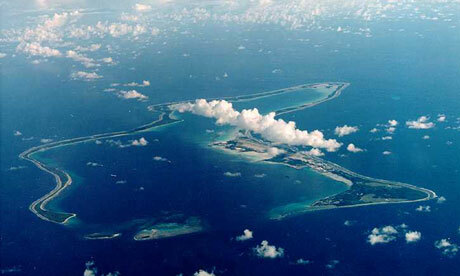 The reserve is named Chagos Marine Park, argued by then UK Foreign Secretary David Miliband to “double the global coverage of the world’s oceans under protection” (in April 2010). With its 545 000 sq-km area the are includes some 220 coral species (half the recorded species of the Indian Ocean), and more than 1,000 species of reef fish. However, the islands was before the 1960′s home to a local people that the British government forcefully removed to give space for a US military air base. The reserve is therefore hotly contested demonstrating with all clarity the multi-level politics of any natural resource management or biodiversity preservation project, and the various and contested ways by which human and nonhuman relations are being forged. Parsing from three BBC News articles from 2004-2010 (see here), and The Independent (here), a short story can be given on how geopolitics, national and international efforts of protecting biodiversity, overlap with ‘local’ dynamics, and the dignity of a people. right to return to their island. In the 1960s the British island colony was leased to the US for an air base, which since then has been in use, not least during the wars in Iraq and Afghanistan. In leasing the island the British government took actions that forcefully removed some 2000 people living on the island, and moved them to the neighboring nation Mauritius. The removal was accomplished through that the British government bought the only company employing people on the island, and then closing the company down leaving island people without an income. This was paired with blocking goods coming to the island, leaving people without income and food forcing them to move. The absence of human habitation has been a key factor in the preservation of the pristine coral atolls, the unpolluted waters, rare bird colonies and burgeoning turtle populations that give the archipelago its international importance. 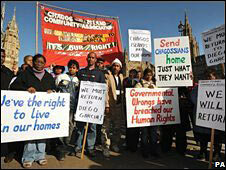 The removed island people, the Chagossians, have run a case before in the British courts to return to their island. In 2008, the British Law Lords voted 3 against 2 in favor of the British government, but islanders continue their case. Although some of the islanders express that they could – in the event of them returning – co-live with a nature reserve if only some fishing and use of the area was allowed, others mean that it “would effectively bar them from returning“. This interpretation was enforced by the recent diplomatic cable released by Wikileaks, which also triggered the Mauritius government to sue the British government in the International Tribunal for the Law of the Sea in Hamburg. In this cable, “[a] UK official is quoted as saying it should put an end to any possibility of the displaced islanders returning“, according to BBC News. This intriguing example draws together different networks and scales of power that generate not only dynamic debates, but also intervenes – and tries to intervene – in a certain physical space and its social-ecological dynamics. A recent move in political ecology has traced such scaled networks, partly drawing on actor-network theory, see e.g. work by Erik Swyngedouw [2, 3] and Nik Heynen. In Chagos these scaled networks seems to be mainly shaped through historical connections to colonial power and empire ambitions, cold war geopolitics, scientific community networks of fact-making, national sovereignty claims, and local identity and claim-making. Whereas local residents were robbed of their homes, dwellings and resources, the British government could earn money on the strategic position of this old colony lying close to the Middle East by leasing it to the escalating military ambitions of post-war US. A side-effect of this, it seems, was to sustain well-working ecological functions in the seas around the islands, preserving species and habitats being lost elsewhere due to fishing and other exploitation activities. Enter the international community of scientists, that by the time of 1990′s had produced arguments and facts of why these types of protected areas are globally important for the protection of marine species on scales greater than just the islands. In confronting the many thousands of fishing vessels and distant fish markets that put global pressure on marine ecosystems, Marine Protected Areas are thought to function as havens and sources of species in networks of energy exchange and species interaction over greater spatial scales. A speculation is then that the quoted UK official, and Mr Milliband, could use the weight of these natural scientifically produced facts to effectively also put an end to the claims by the Chagossians, and come out as triumphant savers of the seas at the same time. Similar cases of how scaled networks influence especially land-based protected areas are plenty in the literature, however, this is one of the most intriguing marine examples I have heard of. Furthermore, the current suing process by Mauritius, and the reason why Chago Archipelago again became news, is due to another novel network of power, namely WikiLeaks, whose activities continue to ripple through the interconnected world of media. Note: The different articles from BBC News can be found here, here, here, and here. More on this news and the Chago Archipelago, see here.